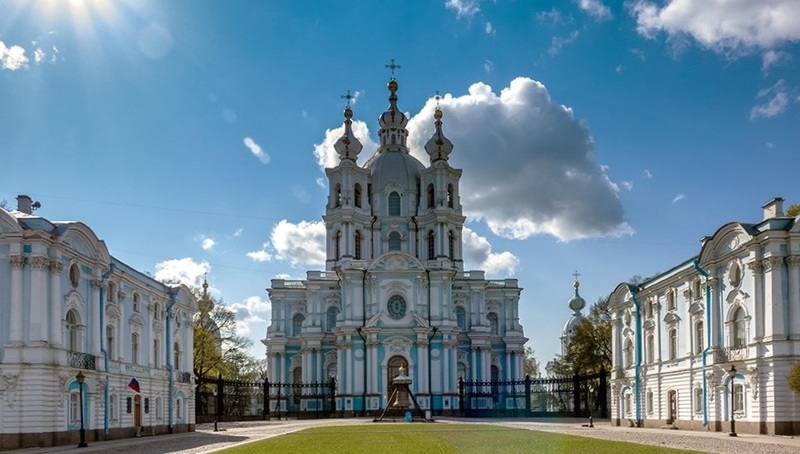 Smolny is one of the symbols of St. Petersburg, the cradle of the socialist revolution. Hence V.I. Lenin led the October uprising and the first decrees on peace and land were proclaimed here. 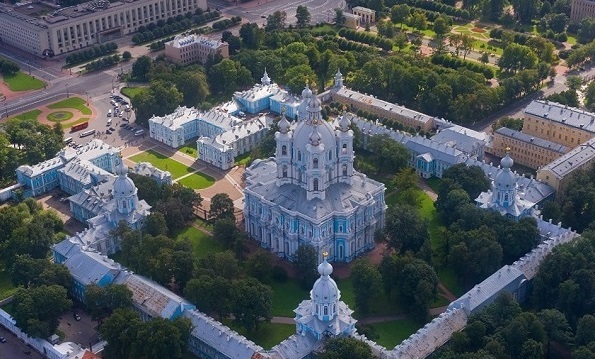 Smolny is one of the most beautiful architectural ensembles in St. Petersburg. The dominant feature of the complex isSmolny Cathedral, which was built in the baroque style by the great Bartholomew Rastrelli. 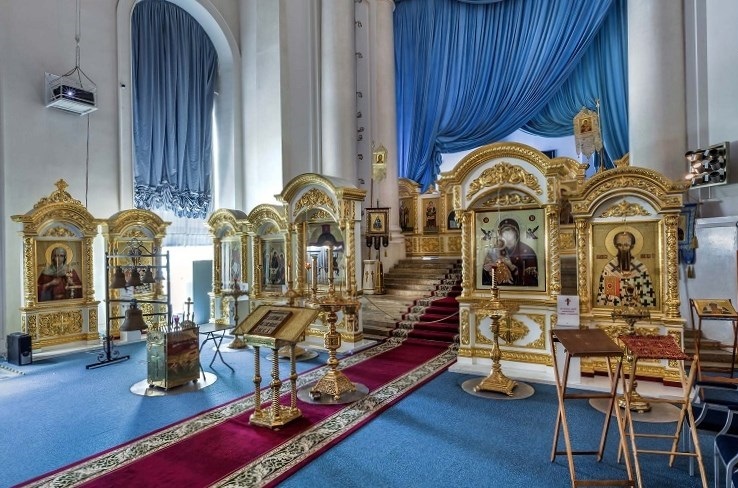 In 1744, a monastery was laid on the territory of the former Smolyany Yard, the building of which was personally supervised by the Empress Elizaveta Petrovna. A church with a bell tower, house churches and the institution of noble maidens had to be incuded to the monastery complex. In 1764, Catherine II at the Smolny Monastery established the Imperial Educational Society of Noble Maidens. In her order it was said that the Smolny Institute’s vocation was "to give the state educated women, good mothers, useful members of the family and society." The monastic cells were not enough adapted to the classes and at the end of the 18th century especially for the Institute of Noble Maidens it was decided to build a construction to the south side from the monastery. The process of the building has begun since 1806 by the Italian architect Giacomo Quarenghi.In 1808 the Institute accepted its first pupils and became the first state women's educational institution in Russia, remaining the most prestigious for many years. The Smolny building, which was majestic and strict in proportion, has been built in the style of Russian classicism with its inherent monumental forms and laconism. The central part is accented by a magnificent 8-column ionic portico, crowned with a gable. In connection with the revolutionary events in the autumn of 1917, the Smolny Institute moved to Novocherkask, where in 1919 its last outlet took place. After the February Revolution, Smolny became the center of revolutionary events. On August 17, 1917, the Petrograd Soviet of Workers and Soldiers Deputies moved here from the Tauride Palace, its revolutionary headquarter was located here. On the third floor was the Military Revolutionary Committee, which directed the overthrow of the Provisional Government. October 24, V.I.Lenin wrote: "... the situation is extremely critical.Clearer than clear, that now, truly, the procrastination in the rebellion of death is similar... it is necessary, by all means, this evening, tonight to arrest the government, disarming (by defeating if they will resist) etc. History will not forgive the procrastination to the revolutionaries who could win today (and surely will win today), risking losing a lot tomorrow, at the risk of losing everything." In the evening of this day, Ilyich arrived in Smolny and from here began to lead an armed uprising. Untill the morning of October 25, all the main strategic objects - bridges and stations, telegraph and power stations, had been in the hands of the insurgents. The Military Revolutionary Committee has published V.I. Lenin's appeal "To the citizens of Russia" which referred the deposition of the Provisional Government and the transfer of power to Military Revolutionary Committee - the body of the Petrograd Soviet of Workers and Soldiers Deputies. And at 2:35 in the afternoon, at the emergency meeting of the Petrograd Soviet, his famous words were pronounced: "The workers' and peasants' revolution, about which the Bolsheviks always spoke, was accomplished." In the evening, a historic shot rang out of cruiser Aurora, notified of the beginning of the assault of the Winter Palace, where the Provisional Government was hiding. A few hours later, the storm ended with the victory of workers, soldiers and sailors. At 22:40 in the Assembly Hall of the Smolny II All-Russian Congress of Workers' and Peasants' Deputies was opened, at which Soviet power was proclaimed. InLenin's appeal "To workers, soldiers and peasants" was proclaimed the transfer of power in the center and in the localities to the Soviets.Decrees were adopted on peace, the land and the decree on the formation of a workers' and peasants' government - the Council of People's Commissars, headed by V.I.Lenin. With the victory of the revolution, Smolny becomes the official residence of the All-Russian Central Executive Committee and the Soviet government.First V.I. Lenin occupied room № 67 in the right wing of the third floor. From the middle of November 1917 until March 10, 1918, Ilyich lived and worked in room № 86 on the second floor. March 10, 1918 the capital is transferred to Moscow and Smolny became the location of the Leningrad Soviet of Working People's Deputies and of the leading party bodies of the city and province. In Soviet times in 1923-1924, in order to emphasize the role of Smolny as the cradle of the revolution, two five-columned portico-pavilions (propylenes) were built at the beginning of the main avenue of the parterre garden. Simple in form and expressive, they draw the front entrance to the territory and organically connect the building with the area of ​​the proletarian dictatorship and the adjoining garden. The authors of the buildings are Vladimir Alekseevich Shchuko and Vladimir Gelfievich Gelfreich.In the loggias there are bronze plaques with the image of the city and region awards. By the 10th anniversary of the October Revolution in 1927, at the main entrance of the building was installed a monument to V.I. Lenin and works of the sculptor Vasily Kozlov. On the pedestal is noted the 1917-1927years, and around it is a bronze ribbon with the inscription "Long live the dictatorship of the proletariat!" In the 1930s, a garden with flower beds and fountains was laid out in front of the building; busts of Karl Marks and Friedrich Engels were installed (works of the sculptor Sergei Evseev). Sculptures are poured out from bronze and are located on granite pedestals. In the corridor of the Smolny on December 1, 1934, Sergei Mironovich Kirov was killed by shot into the back of the head. The murder of the First Secretary of the Provincial Committee of the CPSU (b) was carried out by the instructor of the Obkom Leonid Nikolaev. There are different versions of the murder, including conspiracy and jealousy.After this event, real terror began in Leningrad. Thousands of people were shot and imprisoned. Leningrad folklore replenished with such words as the Kirov, the Kirov expulsion and the murderers of Kirov. During the next years, as a result of Stalin's terror, thousands of clever people were killed throughout the country, millions lost their relatives and friends. During the Great Patriotic War such defense headquarters as the Military Council of the Leningrad Front, the heart of the besieged Leningrad were located in the building. In 1974, the territory around Smolny is being improved. The building of the House of Political Enlightenment as it was called the PAP is being built on the Square of the Proletarian Dictatorship. In 1991, the mayor's office of the Northern Capital moved to Smolny, and now the residence of the governor of St. Petersburg and the administration of the city is located in the building. Smolny Institute in St. Petersburg is one of the brightest architectural monuments, the history of which is associated with important turning points in the life of Russia.